There are various options that can be set when compiling a Linux kernel for the LeapFrog Pollux Platform. 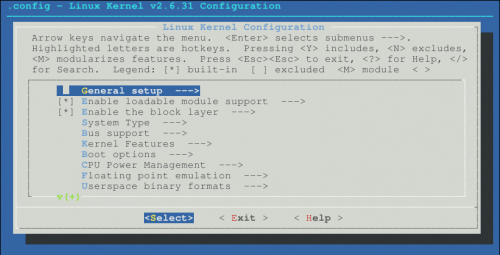 In the linux-2.6/ kernel directory you will find a file called .config, you may need to turn on "View Hidden Files" or ls -al in terminal to see it. This file is where your configuration options are stored. There are also several default config files listed in the SOURCE_CODE/linux-2.6/arch/arm/configs directory. The ones we are interested in are prefixed with lf1000_. It is recommended that you back up your .config file before making changes or replacing it. There is two ways to edit your configuration files, either with a text editor, or the make menuconfig GUI. This tutorial will go over the basics of editing your config file. Tutorials referencing this, should supply you with the options you need to configure, which this guide will help you apply. LeapFrog provides a couple different config files in their sources, listed in the SOURCE_CODE/linux-2.6/arch/arm/configs directory, with names like lf1000_<options>_defconfig. If one of these files has all the settings you need, you can easily make it your default config file by running this command. This copies the lf1000_<options>_defconfig file to the main directory and renames it .config, you can then proceed to build your kernel from here, or if you require some more options to be set, continue on. You'll need to import one of the preexisting config files located in SOURCE_CODE/linux-2.6/arch/arm/configs, if this is your first time building this source tree, if not, you can omit this step. Once you've got a .config file you can then change it by running make menuconfig. This is the first screen you will see after the program loads. Up/Down arrows move the selection and space enters or selects, while Right/Left moves between Select/Exit/Help. You can use the space bar or Y, N, or M to make your selections. Y=include, N=exclude, and M=Module. Include makes it part of the kernel, while module requires loading it from user space. To navigate out of a category highlight Exit, and hit Return, repeat this until you get to the main screen (Linux Kernel Configuration). Exiting at the main screen it will ask if you would like to save, hit Yes if you're all done and want to keep the changes, or No to close and discard all changes. If you would prefer to use a text editor, you can open one of the lf1000_<options>_defconfig files in SOURCE_CODE/linux-2.6/arch/arm/configs with your editor of choice. Then save it to your /linux-2.6 directory renaming it .config. You will see a long list of options. Comment out with a # to deselect the option, or uncomment and change "#OPTION is not set" to "OPTION=y" to enable it. This page was last edited on 20 July 2011, at 19:57.